Written by David Cockley, Cleveland Is A Warm, Fuzzy Place is a children's book first published in 1977 by Corinthian Press (Shaker Heights, Ohio.) It tells the story of a stuffed bear named who notices his girl is missing, and leaves the safety of their home to find her. 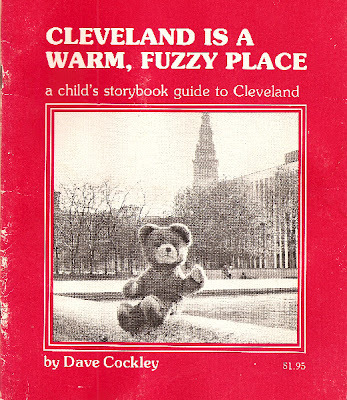 His adventures take him all over Greater Cleveland, an all-encompassing journey and yet left enough ground not covered to inspire a second book called Cleveland Is A Wild, Woolly Place. I had this book as a kid, maybe a little long in the tooth for it (it was published when I was nine, for goodness sakes) but it did intrigue my imagination, especially the idea of taking a stuffed animal and taking photographs of it in unusual places. My mother must have given this book away when I was a teenager, it has lived out its usefulness and someone else could use it. I recently bought both the first and second volumes from Loganberry Books in the hopes of sharing it with my kids. This was not a happy bedtime. Cleveland is famous for making the steel that's used to make cars and boats and buildings. Cleveland makes more machines, more car parts and more paint than any other city in the country. Cleveland is one of the few cities with teams in all major sports, including the Cavaliers in basketball, the Barons in hockey, the Nets in tennis and the Cobras in soccer. Cleveland Browns, the most consistently successful team in pro football history. Benjamin was invited to visit the Cleveland schools, which are among the best in the country. Randall Park Mall, the largest indoor shopping mall in the United States. 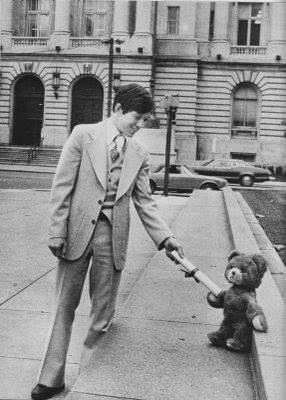 In editions printed after 1979, he is only seen from behind walking away from Benjamin, holding the already-received certificate - as though the photographer just missed the shot. Mr. Cockley has also written plays for children like The Homework Conspiracy and Kids' Countryand is an Instructor of Marketing at the University of Akron College of Business. I feel somewhat betrayed to find Mr. Cockley has also written a book called Columbus is a Can-Do Kind of Place.